I would like to express my most sincere thanks to the Ministry of Agriculture and Rural Development of Viet Nam for inviting me to witness the destruction of 2 tonnes of confiscated African elephant ivory and rhino horn today in Hanoi. The destruction of confiscated ivory and rhino horn today in Viet Nam is taking place only one month after the game-changing CITES CoP17 and right before the Hanoi Conference on Illegal Wildlife Trade. It serves to raise local, national and global awareness about the devastating impacts of illegal trade in elephant ivory and rhino horn and of the growing determination of Viet Nam and the commitment of the global community to put an end to it. The international community has recognized that illicit trafficking in wildlife is not only having a devastating impact on the African elephant, rhinoceros and other affected wild animals and plants, but it also poses a threat to people and their livelihoods – as well as national economies and in some cases national and regional security. Distinguished guests, the destruction of confiscated elephant ivory in Viet Nam today will not in itself put an end to the illegal trade in elephant ivory and rhino. It is, however, ensuring that no one will ever profit from this contraband and, when coupled with the seizure of ivory and the prosecution and conviction of offenders, it will send a very powerful message that Viet Nam is not prepared to tolerate this illegal trade, and that illegal traders now face significant risks along the entire illegal supply chain – in source, transit and destination States. Today’s event also provides a very public opportunity to warn those people who trade illegally in elephant ivory that the age and origin of their contraband can now be readily identified through the use of modern forensics making prosecution and conviction much more likely. And we are delighted that forensic samples have been taken of this contraband prior to its destruction in line with CITES Resolutions. As a result of the global collective efforts that are underway, trading in illegal ivory and rhino horn is shifting from low risk, high profit to high risk, low profit and today’s event sends a clear signal that illegally traded wildlife will not have any future commercial value. Distinguished guests, it is time to be sure we reverse the disturbing trends in poaching and illicit trafficking in wildlife through our sustained and collective international efforts across the entire illegal supply chain addressing both demand and supply. What was adopted by the Parties to CITES when they met last month at CITES CoP17 in Johannesburg is already being translated into actions on the ground at national level. CoP17 saw a number of firsts, including the first ever resolutions on corruption and wildlife crime, cybercrime and on strategies to reduce the demand for illegally traded wildlife. The world hailed these bold decisions made at CoP17. It is now time for equally bold concrete actions. Seizures must lead to investigations and perpetrators of wildlife crimes must be prosecuted. Illegal ivory carving industry and illegal markets must be shut down. Today’s important event serves to raise local, national and global awareness about the devastating impacts of illegal trade in elephant ivory and of the commitment of the entire global community to put an end to it. 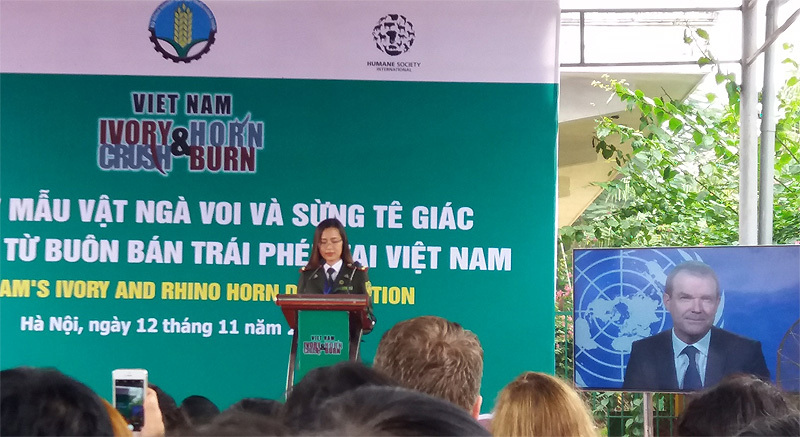 We sincerely appreciate the ongoing efforts of Viet Nam to put an end to elephant poaching and ivory smuggling, as well as other serious wildlife crimes, which is being highlighted through today’s high profile public event.